75228 Escape Pod vs. Dewback Microfighters is a Star Wars set released in 2019. Build and play with a fun LEGO® Star Wars™ Microfighters dual pack including C-3PO, R2-D2, a Sandtrooper and a Dewback! 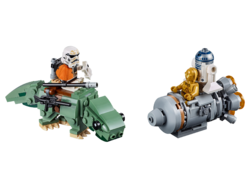 Play out epic LEGO® brick adventures with the LEGO Star Wars™ 75228 Escape Pod vs. Dewback Microfighters dual pack building toy. This set features an escape pod with big engine detailing and space for the C-3PO and R2-D2 building toy LEGO figures, while the buildable Dewback creature has a posable head and tail, clips for attaching weapons and space on top to sit the Sandtrooper. And with separate building instructions for each model, Star Wars fans will love sharing the building experience with their friends and family. 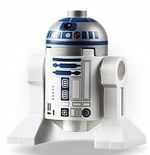 Includes 2 LEGO® Star Wars™ minifigures: C-3PO and a Sandtrooper, plus an R2-D2 Star Wars droid figure. Features a Dewback creature with posable head and tail, weapon attachment points and space to sit the Sandtrooper on top. Also features an escape pod with big engine detailing and space for C-3PO and R2-D2. Accessory elements include the Sandtrooper's electrobinoculars, shock lance and blaster rifle. Share the joy of building with friends and family using the separate building instructions for each building toy. Role-play exciting Tatooine planet scenes from Star Wars™: A New Hope. 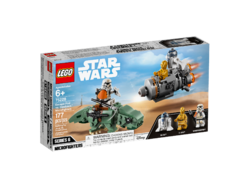 Combines with the 75223 Naboo Starfighter Microfighter and 75224 Sith Infiltrator Microfighter LEGO® Star Wars™ construction toys for even more creative play. Dewback measures over 1” (4cm) high, 4” (12cm) long and 1” (5cm) wide. Escape pod measures over 1” (4cm) high, 3” (8cm) long and 1” (4cm) wide. Facts about "75228 Escape Pod vs. Dewback Microfighters"
This page was last edited on 11 April 2019, at 09:33.